What Is Romanesco Broccoli, or Broccoflower? With its pale green spikes, romanesco broccoli can give kohlrabi a run for its money for the vegetable that most looks like it comes from outer space. Its soft flavor and just barely crunchy texture are less aggressive than its appearance indicates, and it's a favorite among those who know it. 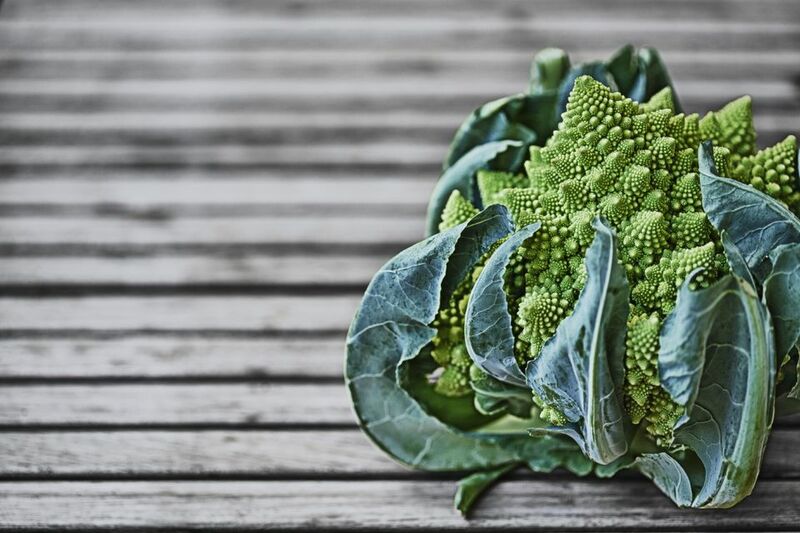 Romanesco broccoli's other names—broccoflower and Roman cauliflower—are less common but somewhat more accurate, since Romanesco broccoli is botanically and culinarily much more like cauliflower than it is like broccoli. It is a member of the cruciferous family, along with broccoli, cauliflower, kale, and cabbage. While many people assume that it is a modern hybrid of broccoli and cauliflower, Romanesco broccoli dates back to 16th-century Italy. That said, it behaves a lot like cauliflower and you can use it as such in most recipes knowing they will carry its green tinge with it. Romanesco broccoli has a much milder, sweeter flavor than either broccoli or cauliflower. Its florets are dense, like cauliflower, with a slightly softer texture. They cook up wonderfully tender while also holding their shape. Since the vegetable lacks that harsh bite when raw that cauliflower and broccoli can have, it's ideal to use if you want to only lightly cook it or serve it raw. You could try including Romanesco broccoli florets on a crudités platter. The unusual appearance draws attention and delight, and can even work as a conversation-starter. Look for these light green heads in the fall and early winter in most climates in the U.S., although warmer areas will see the plant in season through winter and seriously temperate areas will find it at markets for an even longer season that will run into early spring. Look for tight, compact heads that feel heavy for their size. If the heads still have their leaves attached, those leaves should look fresh, not wilted. You can cook romanesco broccoli pretty much like cauliflower, keeping in mind that in some dishes its light green may be less welcome than the white of cauliflower. Since its flavor is a bit sweeter and less harsh, you may find that you don't need or want to cook it as much as cauliflower. Try using Romanesco broccoli in this pasta dish as a gratin, with pesto, or just lightly steamed with a bit of butter and/or lemon juice. What Are Oyster Mushrooms (and How Did They Get That Name)?